C1002 Mandrels Concept and application of mandrels used for testing multimode fiber optic links. C1003 Universal Ports Information about the use of universal ports on OWL optical power meters. C1006 Fiber Optic Reference Methods Covers the basic concept of setting a reference for optical loss testing, and the different reference methods used to set a reference. C1007 OTDR Dead Zones Explains the concept of OTDR dead zones, the effect of dead zones on OTDR measurements, and the use of dead zone boxes to counter the effects of dead zones. Interchangeable Light Source Connector Ports Some fiber optic test equipment manufacturers offer interchangeable connector ports for their test equipment. This video covers the concept of interchangeable connector ports, and exposes a major flaw when using interchangeable connector ports on fiber optic light sources. Qualification Testing of Fiber Optic Networks When testing fiber network installations, it is important to ensure the equipment used to test the fiber is also capable of measuring the quality of the installation. This video briefly explains the concept of qualification, and why qualification testers fall short when it comes to determining the quality of a fiber optic network. C1010 Fiber Optic Cabling Standards Assistance with choosing a OWL test kit -- Explains the concept of a standard in general, as well as how standards benefit the fiber optics cabling industry; and covers the two main categories of cabling standards used to certify fiber optic links. M1002 OWLTrek OTDR Introduction Introduces OWLTrek Series OTDRs, explaining the key features of this device. M1003 OWLTrek Functions and Controls Describes the functions and controls of the OWLTrek OTDR. M1007 Multimode OTDR Dynamic Range Explained Explains dynamic range as it relates to Multimode OTDRs, and why wider dynamic range isn't necessarily a benefit. M1008 ZOOM 2 Optical Power Meter Explains the benefits and applications of the OWL ZOOM 2 optical power meter. M1009 WaveTester Optical Power Meter Explains the benefits and applications of the OWL WaveTester optical power meter. M1010 Micro OWL 2 Optical Power Meter Explains the benefits and applications of the OWL Micro OWL 2 optical power meter. M1011 Fiber OWL 4 BOLT Optical Power Meter Explains the benefits and applications of the OWL Fiber OWL 4 BOLT optical power meter. M1012 OWL FS400 Field Inspection Microscope Explains the benefits and applications of the OWL FS400 fiber optic field inspection microscope. M1013 OWL VS-400-U USB Inspection Probe Microscope Explains the benefits and applications of the OWL VS-400-U fiber optic inspection probe microscope. M1014 OWL VS-400-H Hand-held Inspection Probe Microscope Explains the benefits and applications of the OWL VS-400-H fiber optic inspection probe microscope. T1017 Using AUTO Mode with WaveSource Series Light Sources Explains the benefits and procedure for using AUTO mode on an OWL WaveSource series fiber optic light source. Setting Trace Parameters Demonstrates how to set trace parameters in the OWLTrek OTDR. Trace Analysis/Cursor Placement Demonstrates the use of cursors on the trace screen of the OWLTrek OTDR, and shows proper cursor placement for common types of events when analyzing traces. Working with Stored Traces Demonstrates how to store, name, retrieve, and delete traces while using the OWLTrek OTDR. Miscellaneous Settings Covers the various miscellaneous settings in the OWLTrek OTDR. 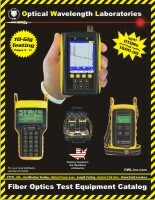 Maintenance and Upkeep Covers maintenance and upkeep issues concerning the OWLTrek OTDR. T1023 Battery Replacement Procedure Demonstrates how to replace the battery for most OWL testers, including ZOOM 2, WaveTester, Micro OWL, Dual OWL, Laser OWL, WaveSource, PCVFL, HOOTS, and BOLT/VOLT units. T1024 Battery Replacement Procedure Demonstrates how to replace the battery in Fiber OWL series optical power meters. Removing Stored Data Demonstrates how to remove stored data from the OWL WaveTester optical power meter. Set User Name and Telephone Number Demonstrates how to set the user name and telephone number in the Fiber OWL 4 BOLT Optical Power Meter. T1027 Multimode Link Certification Demonstrates how to certify multimode fiber links using a Fiber OWL 4 BOLT / Dual OWL multimode test kit. T1028 Singlemode Link Certification Demonstrates how to certify singlemode fiber links using a Fiber OWL 4 BOLT / Laser OWL singlemode test kit. T1029 Multimode Link Certification Demonstrates how to certify multimode fiber links using a Fiber OWL 4 BOLT / WaveSource series multimode test kit. T1030 Singlemode Link Certification Demonstrates how to certify singlemode fiber links using a Fiber OWL 4 BOLT / WaveSource series singlemode test kit. T1031 Multimode Link Certification Demonstrates how to certify multimode fiber links using a Micro OWL 2 / Dual OWL series multimode test kit. T1032 Singlemode Link Certification Demonstrates how to certify singlemode fiber links using a Micro OWL 2 / Laser OWL series singlemode test kit. T1033 Multimode Link Certification Demonstrates how to certify multimode fiber links using a Micro OWL 2 / WaveSource series multimode test kit. T1034 Singlemode Link Certification Demonstrates how to certify singlemode fiber links using a Micro OWL 2 / WaveSource series singlemode test kit. T1035 Multimode Link Certification Demonstrates how to certify multimode fiber links using a WaveTester / Dual OWL series multimode test kit. T1036 Singlemode Link Certification Demonstrates how to certify singlemode fiber links using a WaveTester / Laser OWL series singlemode test kit. T1037 Multimode Link Certification Demonstrates how to certify multimode fiber links using a WaveTester / WaveSource series multimode test kit. T1038 Singlemode Link Certification Demonstrates how to certify singlemode fiber links using a WaveTester / WaveSource series singlemode test kit. T1039 Multimode Insertion Loss Demonstrates how to measure insertion loss of multimode fiber links using a ZOOM 2 / Dual OWL series multimode test kit. T1040 Singlemode Insertion Loss Demonstrates how to measure insertion loss of singlemode fiber links using a ZOOM 2 / Laser OWL series singlemode test kit. T1041 Multimode Insertion Loss Demonstrates how to certify measure insertion loss of fiber links using a ZOOM 2 / WaveSource series multimode test kit. T1042 Singlemode Insertion Loss Demonstrates how to measure insertion loss of singlemode fiber links using a ZOOM 2 / WaveSource series singlemode test kit. T1043 Multimode Insertion Loss Demonstrates how to measure insertion loss of multimode fiber links using a Silicon ZOOM 2 / Dual OWL 850 multimode test kit. T1044 Interpreting OWL Reporter Test Results Explains the different types of fiber link certification test reports that are available with OWL Reporter, and defines the terminology found on these certification test reports. Removing Stored Data and Link Information Demonstrates how to remove link information and stored data from Micro OWL and Fiber OWL series optical power meters. Entering Data Into Text Entry Fields Demonstrates how to enter alpha-numeric text and special characters into the text entry fields in Micro OWL and Fiber OWL series optical power meters. LIVE MODE Demonstrates how to use the LIVE mode feature in OWLTrek OTDRs, as well as extend LIVE mode onto OWLView software for easier trace viewing. T1048 Merging OWL Reporter Data Files Demonstrates how to merge separate OWL Reporter data files into a single large file. VFL operation Demonstrates how to operate the visual fault locator (VFL) port in OWLTrek series OTDRs. T1050 Storing Data in Fiber OWL and Micro OWL series certification power meters Demonstrates the best method for labeling test results, especially when multiple customer jobs are being tested before the data can be downloaded. T1051 Cleaning Optical Ports on OWL Fiber Optic Test Equipment Demonstrates proper procedure for cleaning the different types of optical ports found on OWL fiber optic test equipment. T1052 Methods of Measuring the Length of Optical Fibers Covers the two main methods for measuring the length of optical fibers: reflective and round-robin (aka loop-back). I1001 OTDR Saturation Inversion Explains the issues surrounding the OWLTrek OTDR trace to appear "inverted", and how to overcome reflective events that cause saturation inversion. I1002 NIST Traceability Explains what NIST traceability is, and why it is important to users of fiber optic test equipment.